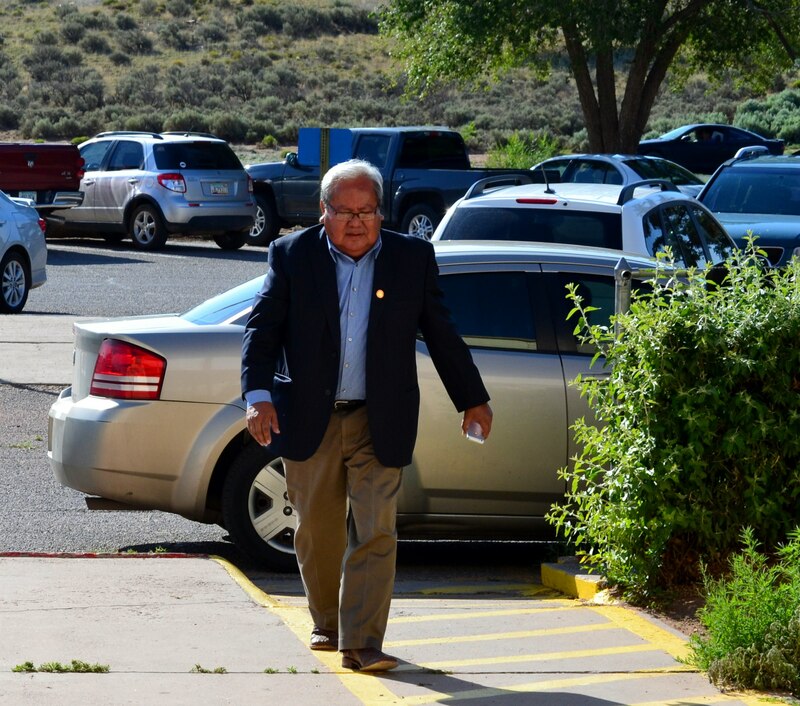 Navajo Council Speaker Johnny Naize arrives at the Navajo Nation Window Rock, Ariz., District Court for a July 18, 2014, hearing on a motion by Navajo Nation Special Prosecutor to hold his trial with current Delegate David Tom and former Delegates George Arthur, Photo by Marley Shebala. (Please provide proper photo credit when reusing photo. )Leonard Teller and Ernest Yazzie. Navajo Nation Johnny Naize resigned as Council speaker and Council delegate at noon today, Sept. 29, 2014. Naize sent a letter of resignation to Speaker Pro Temp LoRenzo Bates this morning. At the time, Bates said that the letter, which was addressed to the Navajo Nation Council and Naize’s chapters, would be attached to a press release, which is was. According to Bates’ press release about Nazie’s resignation, Navajo Election Administration Director Edison Wauneka said that a “vacancy declaration” for Naize’s Council delegate position would be issued today, which would signal to the communities that Naize represented that they have 45 days to recommend a replacement for Naize, whose term would have ended in January 2015, which is when the new Council of 24 is inaugurated. Bates stated in his press release that the appointment of an individual to fill the vacancy would be at the discretion of the speaker or speaker pro tem, which is based on Navajo law. Naize, who has been a Council delegate since 1999, represented the Navajo communities of Tachee/Blue Gap, Ariz.; Many Farms, Ariz.; Nazlini, Ariz.; Tselani/Cottonwood, Ariz., and Low Mountain, Ariz.
“I wish him and his family the best as they move forward,” Bates stated. On Friday, the Navajo Nation Window Rock, Ariz., District Court issued a court order for a 9 a.m. Sept. 30, 2014, “plea” hearing for Naize regarding tribal criminal charges of bribery and conspiracy that the Navajo Nation Special Prosecutor filed against him in December 2013. The Special Prosecutor’s public information office, Abbie S. Fink of HMA Public Relations of Phoenix, Ariz., said today that she could not confirm if Naize’s resignation was part of his plea agreement because the details of the agreement were unavailable. Fink noted that once the tribal court accepts the plea agreement, which is expected to happen tomorrow, Sept. 30, she would publicly release it. Naize pleaded not guilty to the 11 criminal charges in March 2014. And in April, the Council voted 12 in favor, 0 opposed to place him on administrative leave with pay because the criminal charges resulted in the loss of his “good standing” qualification to be speaker and because former Council Delegate Raymond Joe accepted a plea agreement on Feb. 18, 2014, that involved a guilty plea involving an illegal payment of $10,000 to Naize and his family from October 2007 to January 2009. Naize, Council delegate David Tom and former Council delegates George Arthur, Leonard Teller and Ernest D. Yazzie Sr. were scheduled for a joint trial on Oct. 14, 2014. This entry was posted in News Articles and tagged bribery, conspirarcy, Navajo Nation Council, Speaker Johnny Naize, special prosecutor by Marley Shebala. Bookmark the permalink.